Bryant Jennings and Oscar Rivas. Shakur Stevenson (L) and Jessie Cris Rosales. 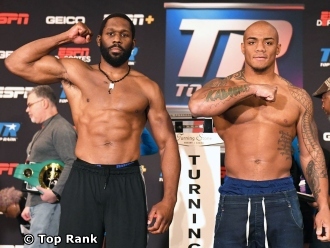 Promoted by Top Rank, in association with Groupe Yvon Michel (GYM), tickets priced at $79, $62, and $45, are available at the Turning Stone Resort Box Office by calling 315-361-7469 or online at Ticketmaster (www.ticketmaster.com).